I was recently introduced to the store OROSILBER which specializes in personalized jewelry and accessories for both men and women. Today however, I am choosing to focus on my favorite pieces for men (aka brothers!) from few of their collections. Men's Jewelry - If your brother is a Salman Khan fan, then I bet he has already seen Bajrangi Bhaijaan (more than once) and would love this memorabilia from the movie. This would be a perfect gift your fan(atic!) brother. Personalized Rakhi - If you brother stays far away, like mine does then you can consider sending him a personalized Rakhi. Something he can wear even after and remember you fondly every time he wears it. Heck, you can even gift it if you live in the same house. At least it wouldn't untie or look weird on his wrist the next day. Name Jewelry - Now, if your brother is older and not someone who can wear jewelry to work, like most grown up men (fingers.crossed) this is the perfect gift for him. You can get personalized cuff links, something he would be able to incorporate in his work life without any hesitation. 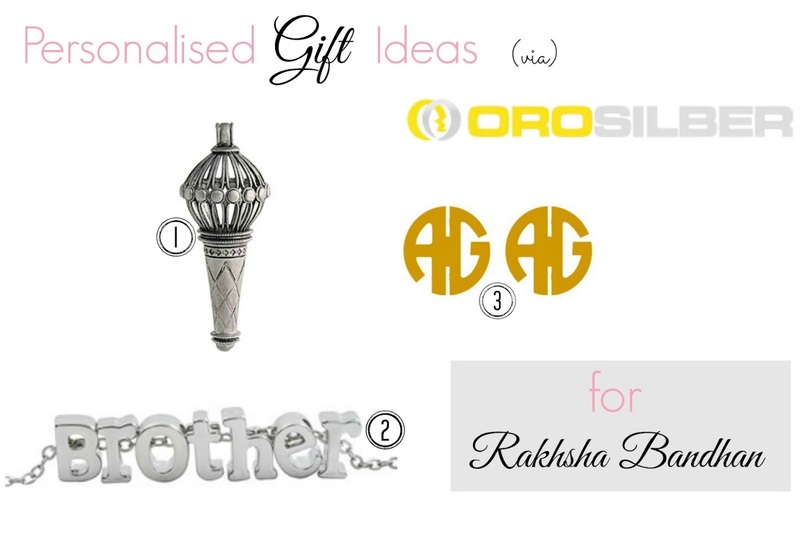 I hope you would check out OROSILBER for your gift needs and do not just stop there. They have a great collection for women as well. Both domestic and international shipping options are available. This post is powered by OROSILBER. All opinions mentioned are my own.